I wanted to take this time and review something that isn't about books, but is absolutely essential in my life: Eye Glasses. I know many writers who have to wear glasses, whether it's for writing, reading, or everyday life - but we also know the cost that comes with getting prescription frames. I can't tell you the endless amount of hours I've spent at the optometrist staring and trying on their selection of glasses and walking away frustrated because most of them didn't have the trendy look I'm looking for, and if they did, it's very expensive! If you have to wear glasses you would know that the cost of just the frames alone can run anywhere between $50 - $300+ even if you have insurance. Prescriptions are generally covered under your insurance policy, but if you dodn't have insurance, you can be charged up to $80 - $200+ depending on your prescription and additional add-ons. What is amazing about Firmoo is that they have an affordable selection of trendy frames for men and women. With frames starting as low as $8.00! Like many book reviewers, when you are approached to do a review, you get a complimentary book for an honest, unbiased review. That's exactly what happened when Firmoo reached out to me. I received a free pair of eyeglasses (of my choice) with my prescription already in it. The service was fast and I received my glasses within a week of my order. There were so many styles that I wanted to choose from, but I ended up picking something different. Clear frames. I figured "hey there free and why not try something new?" I was excited and nervous at the same time when I saw my package in the mail yesterday because you never really know what to expect when you order online - especially with glasses. I'm the type of person who likes to try stuff on before purchasing. My husband was there, of course, eager to see my new frames - which made it even more nerve-wrecking. What if it didn't look right on me? So I took it out of the package and noticed that I received not one, but two cases. For my particular frame, I received a spectacle case and drawstring pouch. I also received a micro-fiber lens cloth and one screwdriver key-chain with extra screws. Once I saw the frames, I was impressed because it looked just like the picture on the website. And then the big moment came and I finally tried them on. I have to say that I absolutely LOVE my new glasses! They are the right prescription and the frames look great. I am definitely going to order my frames from them from now on! 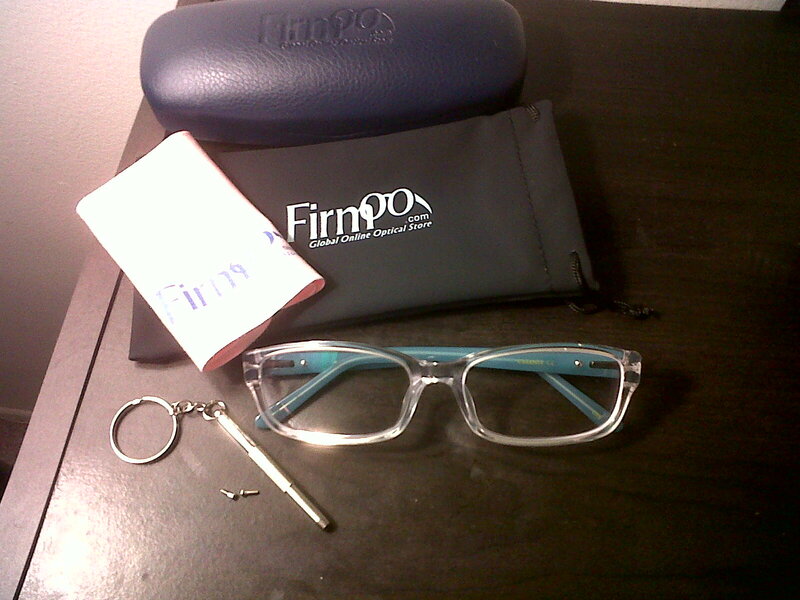 The best part about Firmoo is that they are offering FREE eyewear for first time buyers. Click here to learn more or to order a pair of free frames!